A few minutes after midnight on December 6, 1953, a flight of Georgia Air National Guard jets preparing to land at Dobbins Air Base near Atlanta, Georgia, disappeared from radar screens. Soon afterwards the worst fears were realized when the smoldering remains of the four planes were found at the site of a burned farmhouse near Suwanee, Georgia. After and investigation by the Air Force the official cause of the crash was determined and addressed. This is the story of the events and facts that were not part of the official findings, but are important in understanding what really happened that night. "'Four Down is one of those fascinating stories about an event significant at its time, but nevertheless lost to history. Ben Cole has done a doggedly outstanding job of digging out detailed facts and retelling them is a way that holds our fascination". Thomas F. Norton, Senior Editor, The Southern Aviator / General Aviation News. 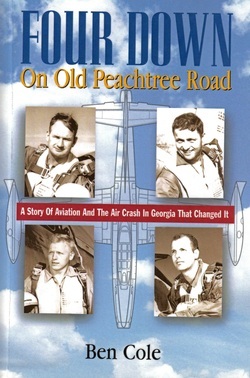 "This is a gripping tale of events leading to a disaster that took the lives of four outstanding young pilots...Ben Cole has done an outstanding job or research and fact finding and weaving it into an interesting and true story." Major General Joel B. Paris III Adjutant General of Georgia Retired, Georgia Aviation Hall of Fame.